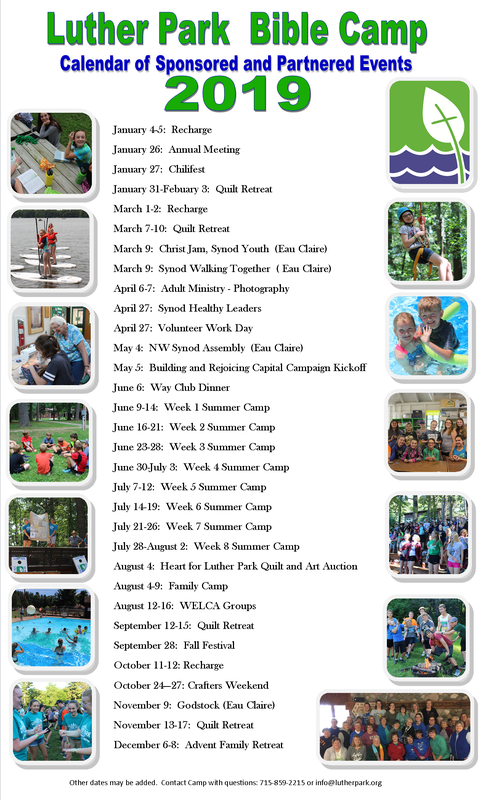 about the events host by and at Luther Park Bible Camp! Come and join quilting friends at Luther Park! Enjoy a long-weekend getaway, complete with meal service and lodging. There will be plenty of time to work on your own projects, or to start new! And of course lots of laughter and fun; truly a blessed time together. Quilters love to share – their time, and talent and even supplies, when needed. Luther Park Adult Ministries is a program for adults to engage in learning and fellowship at Luther Park Bible Camp. We invite all adults to join us at camp for a program presented by a guest speaker, hands on learning, or a trip to an area attraction. Each program at Luther Park includes fellowship over a meal. Trips that travel away from Luther Park will stop for lunch, participants are responsible for their own lunch. Transportation and attraction admission will be included in price of event. Kids Night Out is a Friday night or Saturday night program for children grades K5-6th. The program is planned and facilitated by Luther Park staff as staffing allows. The evening is filled with songs, skits, faith lessons, games, and crafts. Chili Fest! Luther Park is hosting Chili Fest! Come join us for a day of fun activities; sledding, games, crafts. Hot chocolate and coffee will be served along side tasty bottomless chili, hotdogs, and desserts. Come for a chance to win one of our prizes! All profits benefit Luther Park.